Brother to: Anne Margarette, Henry Johann (Sophia Bick), Johann Heinrich “Christian” Dietrich (Emelia Zahn), Christian Rennig Dietrich, Rebecka A. “Bertha” (John Bauermeister) & (Mrs. August Keucker) Von Engeln. 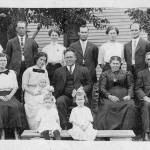 Father of six: Mattie (Herman W. Niedert), Johann H., Rebecca (Albert W. Huenerberg), Herman J., Henry J. (Erna Behrens) and Adelheid Franziska Von Engeln. Herman Von Engeln was born Nov. 8, 1861 at Hanover Germany. In 1871 when 10 years old, he came with his parents to America, locating at Tinley Park, IL. From here the family moved to Eagle Lake, where the departed received religious instruction and was confirmed at St. John’s Church, April 9, 1876. 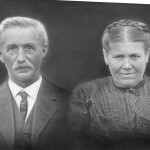 On July 10, 1887, he was married to Miss Louise Thuernau, who preceded him in death December 15, 1918. This union was blessed with six children, of whom two, Johann Herman and Adelheid Franziska passed away in infancy. 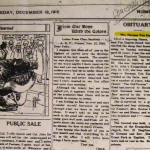 The surviving children are Mattie (Mrs. Herman Niedert) Steger, Rebecca, (Mrs. Albert Huenerberg), Beecher, Herman, Crete, and Henry, Goodenow. 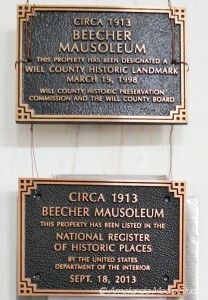 After 23 years of farming, the Von Engeln family, in the year 1910 made Beecher their home, where Mr. 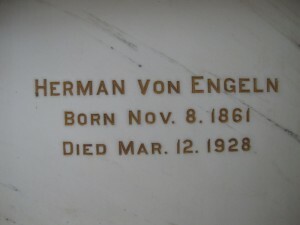 Von Engeln joined St. Luke’s congregation. Following the death of his wife in 1918, he and his sons led the bachelor’s life until his sons were married, when he made his home for a time with the younger son, Henry, and later with his elder son, Herman. With the latter, in the year 1921, he moved to Chicago Heights and in the fall of 1927, to Crete. Contracting a slight cold, little fear was felt of a serious outcome, but after a week’s illness his heart gave away and he died at 2:15 o’clock, Monday morning, at the age of 66 years, 4 months and 4 days. Funeral services were conducted at St. Luke’s Church. Many beautiful floral pieces attested of the esteem in which he was held by his friends. As a loving husband and father, and a true friend to those who knew him best, as one who led a clean Christian life, the departed will be held in fond remembrance. 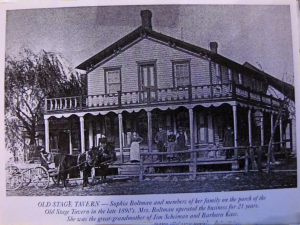 In October 1912, Herman erected a large two story building, adjoining “The Old Tavern.” The building was a substantial frame structure, two stories high. The dimensions were 60 feet by 30 feet, and 24 feet in height. The building was used for a garage on the ground floor, and the upper floor was made into a dance hall. The dancing hall, however, extended back and had a floor space of 60 feet by 46 feet. It was expected that the building would only take two or three weeks to complete. With the establishment of a garage in connection with Mr. Von Engeln’s hotel and bar, it was expected that the place would soon become a noted stopping place for automobile tourists along this famous thoroughfare, even more so than the early days of “The Old Tavern” which has marked that spot for a decade or more. Mr. 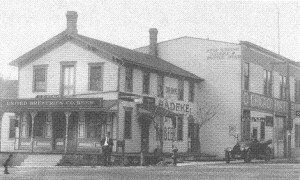 Von Engeln sold “The Old Tavern” garage and dance hall in 1916. Charlotte was the mother-in-law of Herman Von Engeln’s daughter, Mattie Von Engeln Niedert who was married to Herman W. Niedert. We don’t have a photo of Herman or Louise, but we have been given a few photos of his brother Henry and Sophia (Bick) Von Englen. 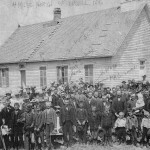 Henry and Sophia made their home in Ludell, Kansas, where he applied his carpenter’s skills like his brother and built the Lutheran Church four miles north of Ludell, Kansas around 1900. This entry was posted in Automated Burial Listing, Burial Listing, Burial Location, HEADSTONE, Obituaries- Have Full Copy, St. John Evangelical Lutheran Church - Eagle Lake, St. Luke's UCC - Beecher by Sandra. Bookmark the permalink. My great grandfather Henry von Engeln (married to Sophie Bick) was born in Hanover. Today, I ran across Christian von Engeln(married to Emelie Zahn) on the internet and wonder how they may be connected. Christian von Engeln was my great grandfather, I will be looking into this.